Experience the battle that defined the Fort at the annual Fort Mifflin flagship event! Four full scripted battles tell the story of the greatest bombardment of the Revolutionary War. 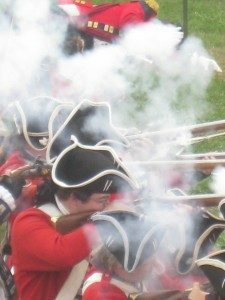 Guided tours, living history activities and demonstrations, musket drills, weapons demonstrations and so much more! Cruise departs from Freedom Pier, Gloucester on the Schooner North Wind at 8:45AM. We will arrive at Fort Mifflin in time for the guided tour, and the 11:00AM battle reenactment. Food trucks are reported to be present, but you may want to pack a picnic lunch. We depart Fort Mifflin after the battle and arrive back at Freedom Pier by 3:45PM.